The University of Nebraska–Lincoln (commonly referred to as Nebraska, UNL or NU) is a public research university located in the city of Lincoln in the US state of Nebraska. 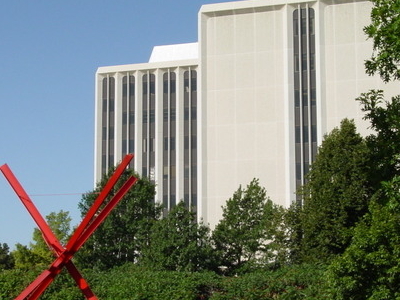 It is the state's oldest and largest university and the flagship university of the University of Nebraska system. The university was chartered by the legislature in 1869 as a land-grant university under the 1862 Morrill Act, two years after Nebraska's statehood into the United States. Around the turn of the 20th century, the university began to expand significantly, hiring professors from eastern schools to teach in the newly organized professional colleges while also producing groundbreaking research in agricultural sciences. The "Nebraska method" of ecological study developed here during this time, which pioneered grassland ecology and laid the foundation for research in theoretical ecology for the rest of the 20th century. The university is organized into eight colleges, located on two campuses in Lincoln with over 100 classroom buildings and research facilities. Its athletic program, called the Cornhuskers, is a member of the Big Ten Conference. The Nebraska football team has won 46 conference championships and five national championships since 1890. The women's volleyball team has won three national championships along with eight other appearances in the Final Four. The Husker football team plays its home games at Memorial Stadium, selling out every game since 1962. The stadium's current capacity is about 85,000 people, larger than the population of Nebraska's third-largest city. Here's the our members favorite photos of "Universities near Lincoln". Upload your photo of University of Nebraska!